Adam Marcus, PhD, is Winship Cancer Institute's new associate director for basic research and shared resources. 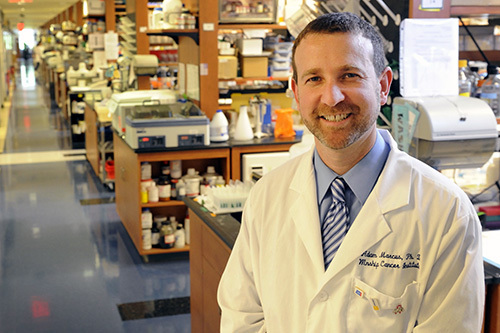 Adam Marcus, PhD, director of Emory University's Integrated Cellular Imaging Shared Resource, is Winship Cancer Institute's associate director for basic research and shared resources, effective September 1st. In this role, he will provide oversight and direction for the development and growth of Winship's shared resources and its basic scientific activities across all of Winship's four research programs. Paul Doetsch, PhD has served in the position since 1999 and has been designated to become the deputy scientific director in the Division of Intramural Research of the National Institute of Environmental Health. "Paul has been the consummate associate director for Winship, with amazing commitment to all the facets of this responsibility. Since joining Emory in 1985, Paul has been instrumental in Winship's extraordinary growth over the years," says Walter J. Curran, Jr., MD, Winship’s executive director. Marcus, an associate professor in the Department of Hematology and Medical Oncology and a member of Winship's Cancer Cell Biology Program, is a funded investigator with several National Cancer Institute (NCI) grants supporting a diverse portfolio of research. He is a national leader in understanding how cancer cells invade and metastasize and how to apply this knowledge in developing new therapeutic strategies. "Since joining Winship in 2006, Adam has established himself as a leader in several research realms, including how a common mutation of the LKB1 protein in lung cancer is associated with a high metastatic potential and how this knowledge can be utilized to develop new therapeutic strategies." says Curran. "Adam has been an outstanding leader of the Integrated Cellular Imaging Shared Resource, and we all know he will be an outstanding associate director for Winship." Marcus is leading the effort to stimulate critical thinking and enthusiasm for sciences in children, kindergarten through 12th grade, in the state of Georgia. Along with Theresa Gillespie, he received a $1.2 million R25 Science Education Partnership Award (SEPA) from the National Institutes of Health in 2016. The grant led to the creation of the Center for Advancing Health and Diversity through Citizen Science where he serves as co-director. Marcus has served as a Georgia Cancer Coalition Distinguished Scholar, American Cancer Society Research Scholar award recipient, and a TEDx speaker. He was honored with a National Lung Cancer Partnership Career Development Award as well as a Fund for Innovative Teaching Award. Last year, he was named to the Atlanta Business Chronicle’s 40 under 40 list, recognizing young women and men who are "metro area movers and shakers."